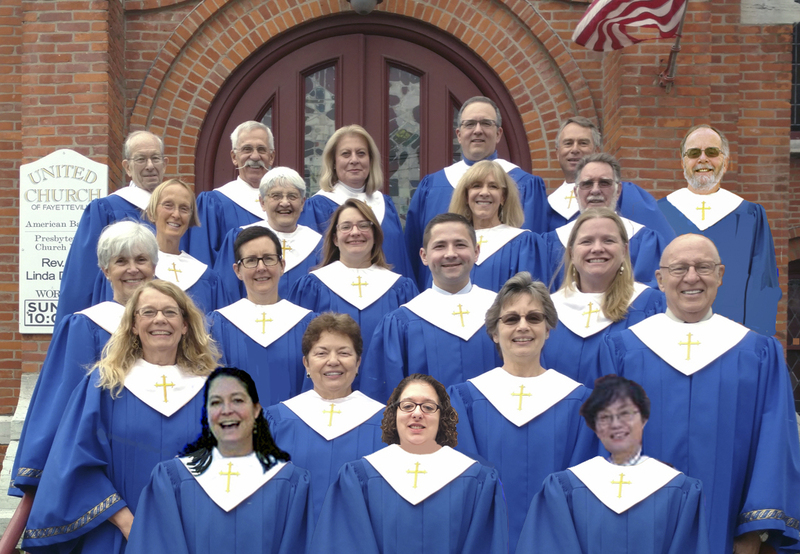 Music is central to our worship life and there are many opportunities for all to share their musical gifts through congregational hymn singing, regular or seasonal choir participation and offering instrumental gifts. Our music staff works with the Pastor to coordinate seasonal and thematic offerings to spiritually enrich the service. Under the direction of the music staff, singers enjoy a variety of music from traditional to more contemporary styles of sacred music. The UCF Choir provides musical leadership for Sunday worship (during the school year) and Holy Week and Christmas services. They typically participate in a community Advent service, and lead one or two Sunday worship services featuring a cantata, hymns, or lessons and carols services. At these times, they are frequently supported by a number of instrumentalists from the congregation and community. 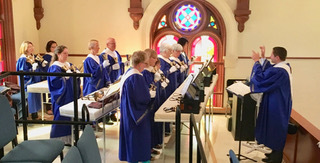 Members use our four-octave memorial set of Schulmerich Handbells and play in worship and community programs with a repertoire that includes, hymns, carols, classics and new compositions. They also open our annual “Brass and Bells” concert in December, where they partner with the Syracuse University Brass Ensemble – an event which benefits a mission or service organization. 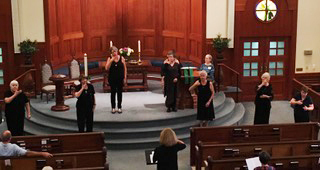 Under the direction of Barbara Morison, members use American Sign Language to interpret hymns and anthems for worship. Their ministry gives our worship another spiritual dimension, while providing access for the hearing impaired. This outreach to the community provides musical Saturday evenings (typically, the 2nd and 4th Saturdays of each month) in the church Fellowship Hall for a nominal fee. Church volunteers coordinate the programs, advertisements and refreshments and donate monies collected to charities with UCF Board approval. Acts have included: Loren Barrigar and Mark Mazengarb, Isreal Hagan, The Cadleys, Todd Hobin, and Doug Moncrief, among others.